Check out 17 amazingly stylish hairstyles for ladies with medium length hair. This Diwali, look stunning with these beautiful hairstyles! This Diwali- go for a stylish hair makeover. Whether you have long, short or medium-length hair, Zuri recommends you dress up in style and look fabulous this festive season. With long or short hair, an awesome haircut and versatility are the key highlights, but ladies with medium-length hair often complain of monotonous, boring-looking hairdos. They are not left with much of an option. Either straighten the wavy hair and wear them poker-straight style or do a quick updo. That’s all! But, sweat no more, we bring to you 17 beautiful hairstyles for medium-length hair which are broadly categorized into these following types. With these recommended hairstyles, you will actually feel like you are in the ideal-zone for trying out chic as well as traditional look with an ease. 1. Soft Curls: Style your hair in the soft curls style coz it’s gorgeously feminine. It’s the perfect hairstyle for literally every occasion. You can pull it off in a saree and also look polished in a western outfit. Besides, when you are in no mood to add a few curls and leave the hair texture as is, just run a flat-iron through your hair a few times and tuck it behind your ears for a center slick look. And when in doubt, throw your hair over your shoulder and give it a quick curl. Tie the curls in a side ponytail. 3. 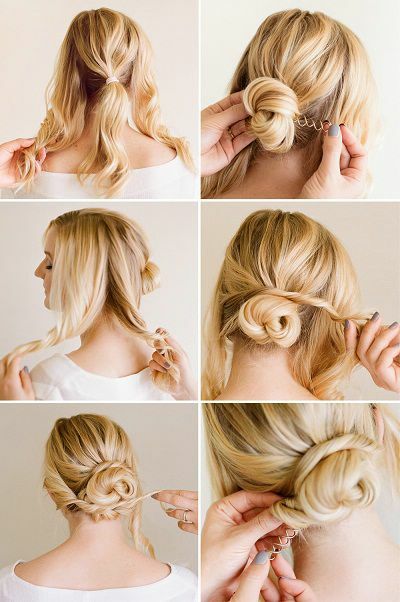 Stunning updo: Other than the regular bun, you can also try a lot of variations with your medium-length hair. Modern knots are rather loose and messy. You can also create a braid and then tie it up in an updo. Go for an easy-twisty bun by making use of two elastics and bobby pins, keep your hair in place with this gorgeous and easy updo. You can also look simple yet charming with a half updo hairstyle. The twists wrapped bun is yet another easy-to-do hairstyles. So, see, so many variations! Aren’t you in love with your medium-length hair?